Thoughts resemble waves that rush to the shore. Sometimes, the ocean is quite, and there are either no waves at all, or only small ones. 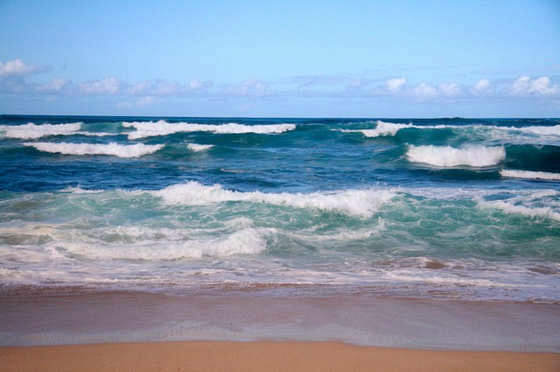 At other times, especially on a windy day, the waves are high and strong, and they rush to the shore. As one wave arrives to the shore, another one immediately follows it. The waves create roaring sounds, especially when they break against the rocks on the shore, and splash drops of water into in the air. The mind is like the ocean, and the thoughts that pass through it are like the waves in the ocean. The mind is always restless and busy with the endless number of thoughts that pass through it, just like waves rushing to the shore. There is a constant movement of thoughts in the mind. This is a deeply ingrained habit, of which most people are not aware. You become aware of this activity, only in certain situations, such as when you need to do something that requires your full attention. Then, you become conscious of the great number of thoughts that pass through your mind. Even if you cannot still the movement of the waves of thoughts in your mind, you can, at least to some extent, calm down their flow. Why you need to calm down and slow down the nonstop flow of thoughts in your mind? 1. As the body needs to rest, so it can refresh itself, so the mind needs rest to rejuvenate itself. 2. A calm mind helps you see details and recognize opportunities that a hectic mind cannot see or recognize. 3. A calm mind helps you handle efficiently the affairs of your daily life. 4. The mind works better and more effectively when there is inner peace. 5. If you wish to focus your mind, you need to quiet down waves and storms in your mind. 6. You cannot focus on the answers in an examination, drive your car carefully, do a work that requires attention, write an email or meditate, if there is a nonstop storm of thoughts in your mind. 7. You need to make your mind quiet in order to think deeply, pay attention to details, study, or make a wise and important decision. It is easier for a boat to sail when the waves and the wind do not push it back. It is easier to think, act and work when there are no thoughts that distract you, worry you, or make you anxious. The two main methods to quiet the waves of the mind are concentration and meditation. They might not be everyone’s cup of tea, especially since most people nowadays do not want to spend too much time and effort to improve these skills. They want instant results, but that is not always possible. Instant methods do not always work. You cannot learn a foreign language in a few days, nor get a medal at the Olympics, without training and spending time and effort. You need to become aware how restless the mind is. Sit down in a quiet place, and pay attention to what is going inside your mind. This might feel strange, especially if you have never done so before. 1. You will learn a lot about your mind. 2. You will learn about your thoughts. 3. You will have a first-hand experience of how thoughts move in your mind. 4. You will learn what inner peace is. Try to watch your thoughts, as if you are watching a procession or a parade. Just watch the thoughts coming and going, while at the same time trying as much as you can to abstain from becoming involved with your thoughts and following them. You might be surprised at the number of thoughts that will pop up into your mind, sometimes, at great speed. It is exactly like waves rushing to the shore, one after the other, never stopping for a moment. Each thought would try to draw your attention and make you forget to watch your thoughts. You might discover that your attention is moving swiftly and with no control from one thought to the other. You will discover that you cannot continue watching your thoughts for more than a few seconds. Soon, a certain thought will dominate your attention, and then a different one will take hold of your mind. Suppose you could quiet these thoughts, and chose to think only the thoughts that you want. This can become possible when you teach yourself to become the boss of your mind, but this requires some effort and inner work. Teaching yourself to focus your mind, practicing meditation, and increasing your willpower and your self-discipline, would help you become the boss of your mind. This would also enable you to calm down the waves that keep rushing inside your mind. Go to the beach on two different days, when there are strong winds and heavy clouds, and when the weather is nice, the sky is clear and there are no winds. On which day is it more pleasant to walk along the beach? On which day it is safer, more enjoyable, and you can see the horizon? The answer is obvious. It is the same with your mind. Life becomes easier and more enjoyable when the mind is calm and relaxed, and this is something you can do, with some training. “The mind is a wonderful tool. It is more sophisticated than the most advanced computer, but its restlessness prevents you from enjoying calmness and inner peace. You cannot enjoy peace and tranquility, if you allow every insignificant thought to attract your attention and occupy your mind. What happens, when you throw something into the ocean when there are waves? The object you throw, will be tossed around, now high, and now low, now on this wave and then on a different wave. This happens to anyone who allows his or her thoughts to carry them where they wish, with no control and no focus, and you certainly do not want this to happen. Browse the articles at this website and check the list of books below. They will all help you calm the storms and the waves in your mind.